(i)Shri Amitabh Verma, IAS (BH:1982), Chairman, Inland Waterways Authority of India under Ministry of Shipping is repatriated to the cadre with immediate effect. (ii)Ms. Nutan Guha Biswas, IAS (AGMUT:1983), Additional Secretary, Ministry of Women & Child Development as Chairperson, Inland Waterways Authority of India under Ministry of Shipping in the rank and pay of Secretary, by temporarily upgrading he post till 31.07.2018 or until further orders, whichever is earlier vice Shri Amitabh Verma, IAS (BH:1982). 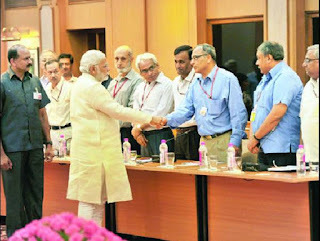 (iii)Shri Bala Prasad, IFos (MN:1983) (presently on compulsory wait), as Additional Secretary, Ministry of Panchayati Raj vice Shri A.K.Goyal, IFoS (KL:1981) (superannuated). (v)Ms. Vandita Sharma, IAS (KN:1986), Member (Finance), Atomic Energy/Earth Commission, as Additional Secretary & Financial Adviser, Department of Space vice Shri A. Vijay Anand, IRS (C&CE:1980), (superannuated).